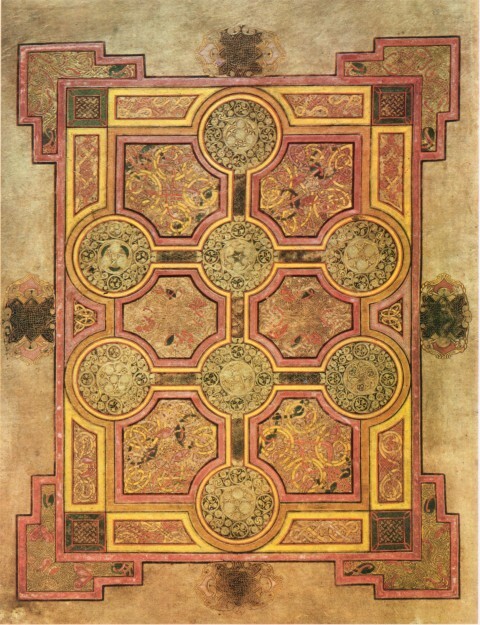 This may be a bit of a stretch, but the carpet pages also remind me of buddhist mandalas. A kind of representation of the macrocosm, with the four corners of the earth. I also wonder about any numerical significance of the decorations, but that may also just be my affinity for numerical symbolism. I’d say there are definitely connections between Muslim prayer rugs and Christian carpet pages. 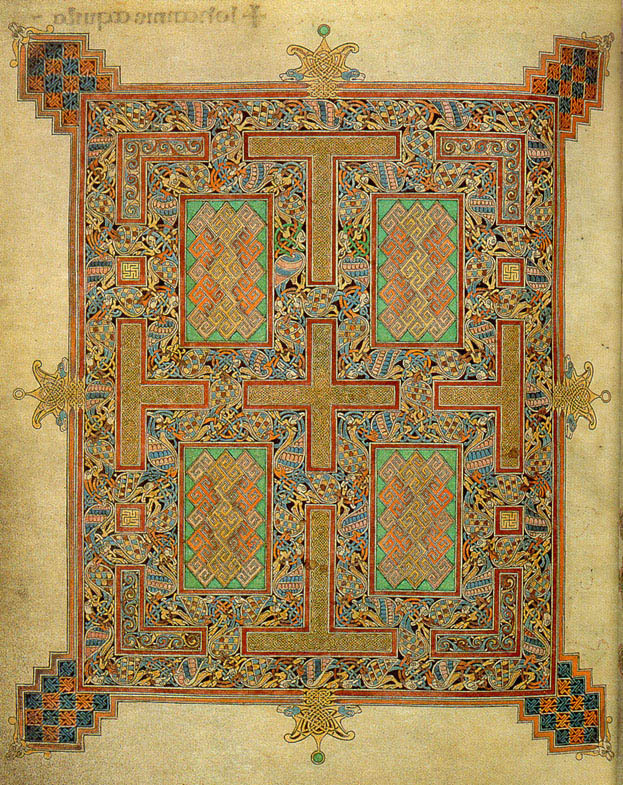 I wonder if you could link the artists of these pages to people who went to the Middle East during the Crusades? 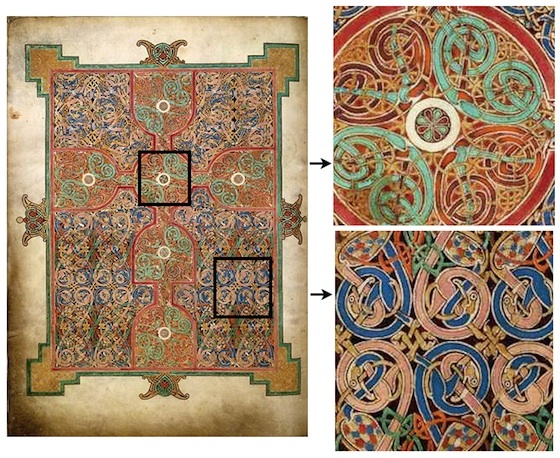 Michelle Brown has done a lot of work recently on the connection between carpet pages and prayer rugs, in her 2003 and 2011 books on the Lindisfarne Gospels (the latter drawing heavily on the former), and a bit in her book on manuscript illumination. 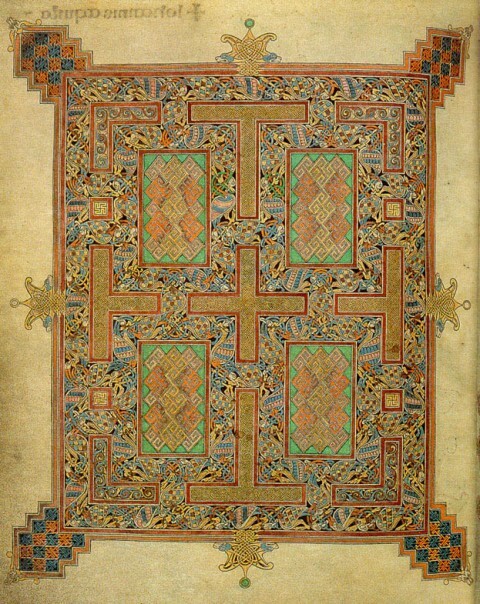 Hourihane touches on the discussion in his entry on Carpet Pages in The Grove Encyclopedia of Med. Art and Architecture. 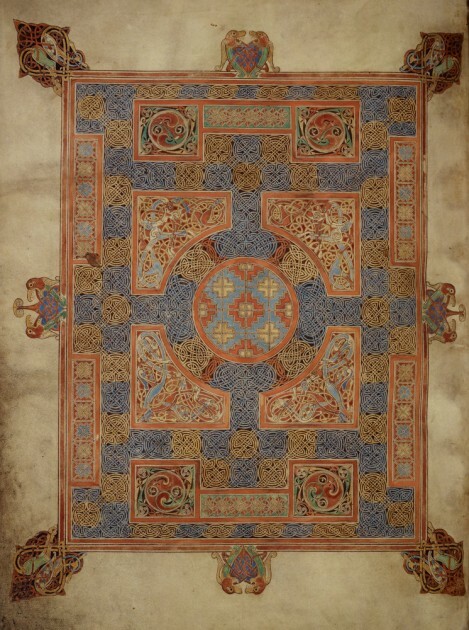 The British Isles had extensive connections with the east through trade and missionary work–this shows up in manuscript decoration and other material objects, like coins. Irish and Anglo-Saxon monks also used prayer rugs that were a lot like Islamic prayer rugs; I presume that the influence could have flowed both directions. Perfect! Thanks for pointing out Michelle Brown’s work, Zillah. 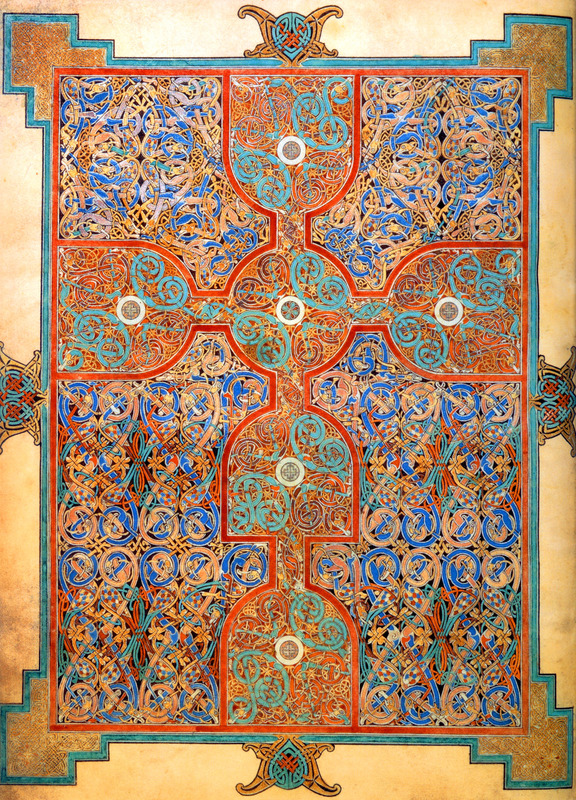 I also didn’t know that monks had actual prayer rugs which looked like Islamic prayer rugs. Fascinating! I haven’t found any pictures of such actual rugs yet, but I’ll look into Michelle Brown’s writings to discover more. I love that you are reminded of mandalas, Phin. 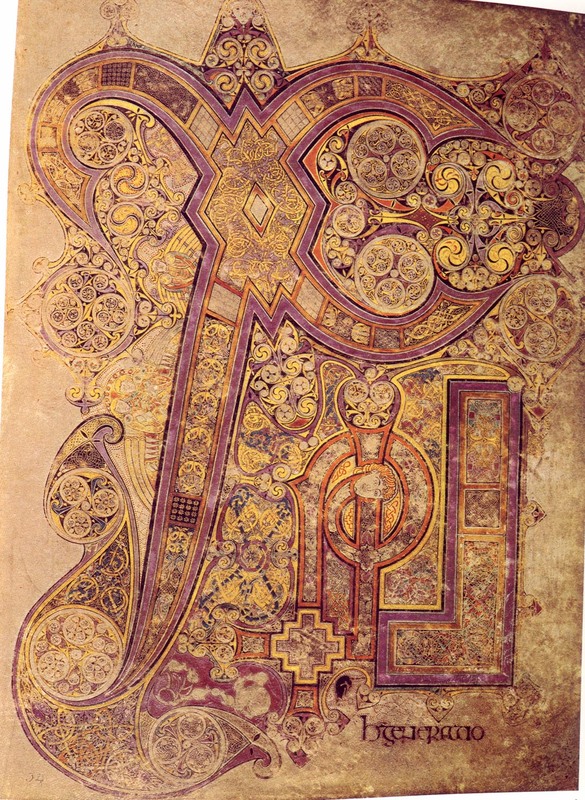 I don’t know if there is a connection, but I do think there are some similarities with geometric abstraction and a general interest in symmetry. It would be interesting if we could connect specific artists to the Middle East. The examples I show in this post pre-date the Crusades, but trade and missionary work are viable possibilities for cross-cultural influence. I know that Eadfrith of Lindisfarne was the artist and scribe responsible for the Lindisfarne Gospels, and perhaps scholar Michelle Brown has made some connections between Eadfrith and the Middle East.